NAMSC would like to invite you to become an official or, if you are already accredited, welcome you to our events. If you would like to continue your training to reach a higher level NAMSC will help you achieve this. Please get in touch via email or our Facebook page! Becoming a motor sport official is the best way of getting close to the action without being in the drivers seat. Volunteer officials are a vital part of motor sport and without them the sport could not function. Officials ensure that events are conducted safely, fairly and that the rules and regulations are upheld. Every motor sport event requires a number of officials with various skills to perform a wide range of tasks. Events such as the Australian F1 Grand Prix and Rally Australia need over 1,000 officials, whereas a club-level motorkhana or hillclimb need only a few. The Licencing and Accreditation Guide is a reference guide for new and current CAMS Accredited Officials containing information on the National Officiating Program; licence application, upgrade and maintenance; training and development; policies and procedures. The CAMS Accredited Official licencing structure has two parts: Graded Officials Licences and Non Graded Officials Licences. Graded Officials Licences have six grading levels and are available to all CAMS Accredited Officials to achieve. Non Graded Officials Licenses have two types: Specialist Licence holders are those that hold professional qualifications and are registered medical service providers. Appointed Licence holders are those that have been appointed by the management of CAMS. The diagram below shows the licence pathway and the available disciplines in which to specialise at Bronze level. 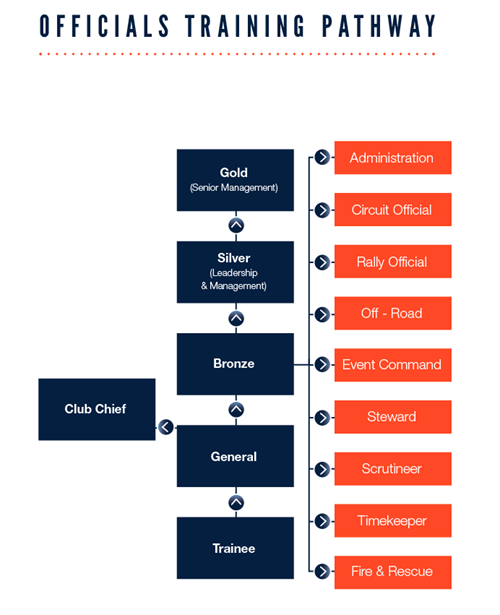 Each of the disciplines in blue have an associated training module, as does General Official (Introductory Module), Club Chief and Silver level. For more information on training modules, visit Training.